Modern Industrial 13 is an original, abstract painting from the Modern Industrial Series. This one-of-a-kind painting was created with acrylic paint on gallery-wrapped canvas. It has a width of 18 inches and a height of 18 inches with a depth of 1 inch (18x18x1). There are nine, individual 6x6x1 inch canvases. 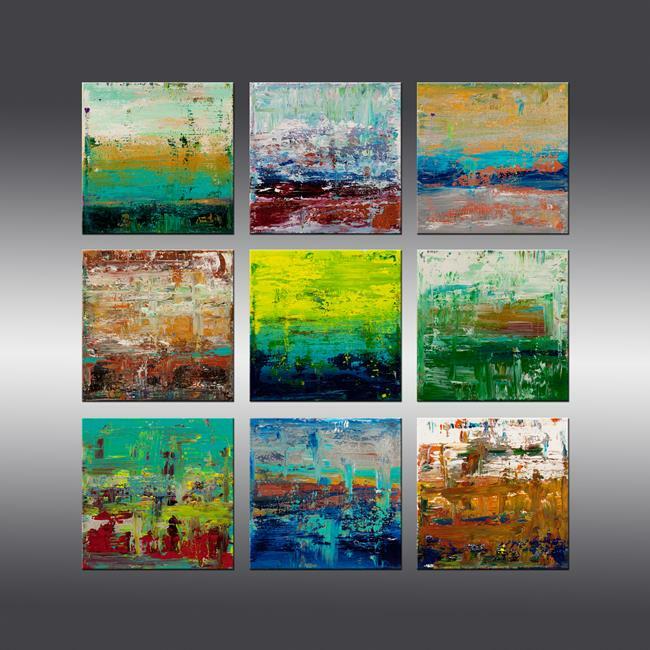 To hang these canvases, you will need to allow for space in between each canvas, so the painting will be closer to 20x20 inches after hanging (or more based upon personal preference). The colors used in the painting are purple, blue, yellow, green, white, gray, red, orange, turquoise, and iridescent, metallic gold, copper, and silver. The painting will be signed and dated on the back. Shipping of the painting includes insurance, tracking, and professional packaging.